glove in the rain . . .
Waterproof gloves are brilliant. I think it unlikely that anyone reading this, who has experienced the indescribable unpleasantness of riding lengthy periods with sodden hands will disagree. As pointed out in another review on this site, your hands are the primary contact you have with your bike. they are the main things you use to bend that couple of hundred kilos of metal to your will,and often the first communication method your bike uses to tell you what's happening. So having them numbed from cold is A Bad Thing. The trouble with many waterproof gloves is that they are also winter gloves. Now personally I don't like wrapping my hands in duvets before going riding - I still can't feel what's going on and though I'm fairly warm my control inputs are clumsy and my bike can't talk to me - and that means enduring wet hands to keep track of what's going on. Until now, that is. 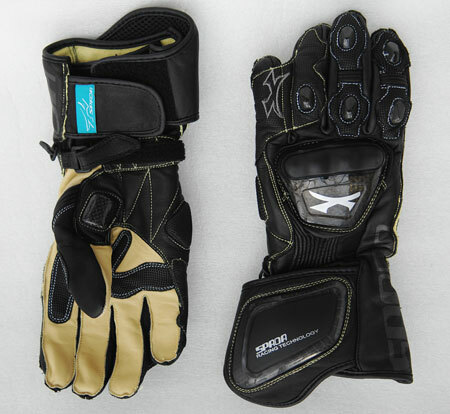 Because the Spada Elite WP glove is a waterproof sports glove that would appear to offer the best of both worlds. One thing to get straight from the beginning, though. These are NOT winter gloves. In fact, they're just about all season gloves, provided you're really hardy or have reliable and fairly meaty heated grips. And that's the point, really. These are, at first glance anyway, just regular sports gloves. In fact they are a bit more than that. I'd look at them rather more as premium gloves. They have the kangaroo skin palm of top end kit, carbon and PU armour in all the places you'd expect it, kevlar reinforcement and some extremely comprehensive wrist fastening. They even have a web between the pinkie and ring fingers that reduces the likelihood of serious injury in the event of a high speed off. In short, these are extremely well appointed race gloves. It doesn't change when you put them on, either. They are reassuringly well made and solid feeling, while remaining thin enough to give ample feel. There aren't any vents on the backs, which may prove a double edged sword come the summer. But so far I've yet to wear them in anything warmer than a mild autumn day, and they have been perfectly comfortable both on and off the bike. They are easily as comfortable a fit, off the peg, as any of the other gloves I've been using for the last few years, which is praise indeed. So far, so good then. But their neatest trick manages to be both invisible and invaluable, both at once. These gloves are genuinely waterproof. 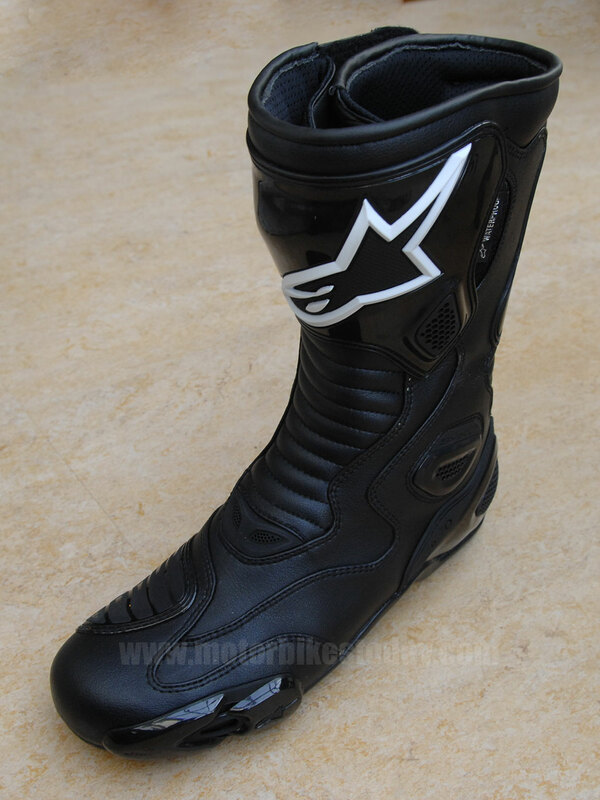 I have ridden in the rain with them on, intentionally, and remained dry and comfortable. I have ridden in the snow with them, unintentionally, and remained dry and rather less chilled than I expected. And, in conjunction with the Spada Predator boots tested elsewhere on this site, I have shovelled snow, thrown snowballs and generally messed around in the copious quantities of fluffy frozen white stuff we've had over the last week or so and my hands and feet have remained perfectly dry. Not only that, but the gloves have shown no sign at all of suffering from the experience - something I couldn't say for the extremely expensive full winter gloves which fell apart after far less abuse in our February snow earlier this year. 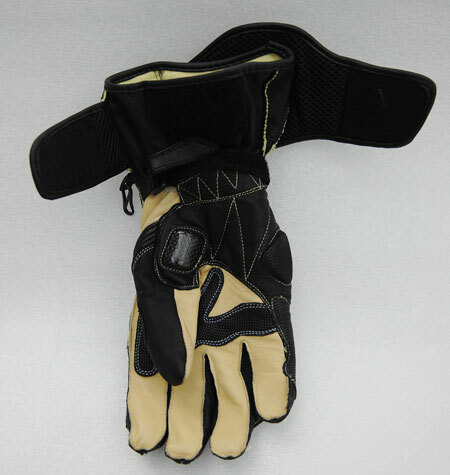 The double fastening cuff, along with the the single wrist strap, makes these gloves a little more complicated than others to put on and makes the cuff slightly bulkier than ideal. It's not a problem, but does make it just a little fiddlier getting your jacket cuffs over the top of the gloves when it's raining. And of course you need to do that or the water runs down your sleeves into the glove, rendering the waterproof properties slightly superfluous unless you're relying on the wetsuit effect to stay warm. That complicated fastening means that you're just about guaranteed to get a good, secure and comfortable fit when you do the glove up, though. And that's really important as I've seen plenty of pretty nasty injuries from gloves coming off in a crash and the rider's hands taking the brunt of it instead of the gloves. Add the carbon moulded armour protecting the scaphoid at the base of the thumb (very vulnerable in a crash), impact absorbing PU armour on the back of the hand and individual knuckle armour on each finger and it's pretty clear that these gloves are serious contenders when it comes to protection. The obvious high quality just goes to reinforce that feeling, along with the well designed overlapping panels, intelligent use of more exotic materials where needed (kangaroo hide is expensive because it's very tough indeed but harder to get in decent quantities, for example). And to top it all off, they look pretty good as well. But though we've looked at all the cool things these gloves do, there's one more ace that Spada have tucked up their sleeves. You see, I've just spent a frustrating period of time wandering around the traders' stands at Motorcycle Live (or the Bike Show if you prefer) looking at gloves. Partly to get an objective comparison of quality and design, partly to see what else is out there. And while there are indeed other sports gloves which claim to be waterproof, none of them seem to be significantly better made. None of them are notably better looking, either. None of them were more comfortable, even those from my erstwhile favourite brand (and that really was a surprise). And all of them, even at show prices, were around double the recommended retail price of these gloves. Or more. Yes, ladies and gentlemen, the Spada Elite WP glove, which genuinely is waterproof, well made, protective, secure and good looking, retails for just £69.99. The cheapest credible rival I saw was fifty pounds more. That makes these gloves the bargain of the century. Even if these gloves were priced at a similar level to their rivals I would recommend them for all the virtues already discussed. But at this price you can probably genuinely justify buying a pair, even if you never ride in the rain, just for the occasions when you get caught out. This is Britain, after all. And if you're even a vaguely all weather rider then I would urge you to pop down to your local motorcycle clothing emporium and pick up a set today. They really are that good. Copyright © Motorbikestoday.com 2010. All rights reserved. Users may download and print extracts of content from this website for their own personal and non-commercial use only. Republication or redistribution of content, including by framing or similar means, is expressly prohibited without the prior written consent of Motorbikestoday.